He’s a rule-breaker, a wannabe ladies man, an idiot and a sometimes liar, but he has a good heart and a good sense of humour. Vince Barlow always wants to do the right thing. Having deserted his army, Vince ends up in Flensburg with his dog Bingo, chasing after a German girl he met in Afghanistan. When he finds her and she rejects him, he stays in Flensburg to earn some money, enough to get his beat-up VW van back on the road, but a series of mishaps gets him embroiled in a local crime. While not terribly bright, Vince somehow gets it together in order to save the day and come away unscathed. 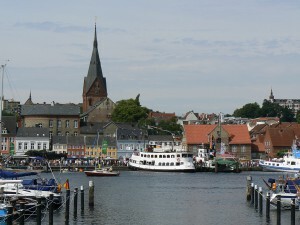 But he can’t seem to leave Flensburg, and he becomes something of an accidental private detective, aided by Bingo and a few local characters he gets to know. Vince is a good listener and people feel they can come to him with their problems. He wants to set things right, but is often not adept or smart enough to do it. Despite his best intentions, he always ends up involved in some kind of crime, with the odds stacked against him, and often succeeds through dumb luck and the mistakes of others.